YOU MUST FOLD DARTH PAPER! Here are Harvey’s Darth Paper Instructions! These are Dwight’s instructions for folding a simple Origami Yoda finger puppet as told to Tommy and illustrated by Kellen. Start with a quarter of a piece of paper. (Cut it in half, then cut one of those pieces in half.) If you can find paper that’s green on one side, start with the green side down. Tom, i dont have the book, but who my friend came over, he did, and he is a really heavy sleeper, so i stole the book from him and read it all in one night. purple. oh yeah i also put it back. purple. hey gyz whenz the next contest? seriously? conor, HOW THE TOGRUTA DO YOU HATE THE STAR WARS?! but i used to hate star wars, so that WOULD have had more emphasis. Wow! I have that book and I made an origami yoda and it was SOOO COOOL! it’s just I would like to make a real good one instead of the simple one. dude, this is the cutest thing i’ve ever seen. i heart star wars. thanks so much for the instructions! hi, there i just read this and the book is awesome but the instruction’s are hard My favourite is when everybody does the twist but part i don’t like is when harley writes his comment’s because he say’s stuff that i even can’t believe?! It’s HARD! Great instructions! First Yoda was not good at all. My problem: It would’ve been perfect if I knew how big the paper should be! Thanks! YAY ME TOO I GOT THE HARD ONE RIGHT BUT THE ESIY I WRONG. 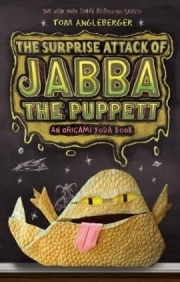 i was very impressed on the book.i finished reading it today and was thrilled reading every page of this origami yoda book.if you can send me a list of other good stories like the one i read. i have the book and it is AWSOME!!!!!!!!!!!!!! Actually, if tom was right, and that was the Van Jhanke design, then he would need permission. I love origami! It is so much fun to try the new folds although I will admit many are beyond what I can do! I can do the wtc (World Trade Center), The Empire State Building The Chrylster Building and Yoda!! I’d like to see pictures of these! How was he to big? was it his head that was too big? This model of Origami Yoda is awesome! I think ages 7-11 can make this.At school, students ask me to make one,but I ran out of paper. If your not ready for the Yoda on the fron cover of the book, I suggest you make this one tons of times first. It’s really cool… But I’ve seen better. WHAT DO U MEAN YOUVE SEEN BETTER!!!!! this is like the best origami book known to man!!!!!!!!!!!!!!!!!!!!!!!!!!!!!!!!!!!!!!!!!!!!!!!!!!!!!!!!!!! I made a yoda and it is sooooooooooo cute i even took it to school and made my own yoda voice and gave out advice (some of wich actually worked!) i also decided to draw the doodles of yoda from the book!!!!!! I’d like to see some of those doodles! so get this… my name is Dwight i made the hard yoda and i give out advice at school… and my friend henry [sounds like harvey] dosen`t believe in him! cool huh? wow!The life of yoda came to real life! Is there any body that sounds like Tommy or Kellen? Tom can’t remember how to. Just like Dwight. Hey Tom how did you come up with the book of origami yoda? It’s actually a really good book. I couldn’t stop reading it. Do you mind coming up with a graphic novel. Like um….. A book about origami star wars! Like a copy of the star wars and their only origami mini figures, that would be AWESOME! Great idea! Maybe I’ll get to do that someday! Of course I’ll have to learn to draw better first! I’d love to make this Yoda, but I don’t know where to get the green and beige paper, any suggestions? I use green wrapping paper, which is brownish on the reverse side. Sadly, I’m running out and having trouble finding more…! Funny book is, read it you should. BUT!!!!!! Not as COOL. :-! I’d love to see your Origami and your read your story. Just email them to me at tom@origamiyoda.com! Just email me the photos or the story… tom@origamiyoda.com … I’d love to see them! hi! I love your book!!!!!!!!!!!!!!!!!!!!!!!!!!!!!!!!!!!!!!!!!! Well, no one is making a REAL movie right now. But some kids have made their own Origami Yoda movies…. Why don’t you borrow a camera and give it a shot!?! I am doing the 1000 origami yoda contest. For a while I thought I only had a day to do it! Thank goodness I have a year! Don’t tell me that it is going to take a full year to make a origami Yoda. Because it took me a year to make a big origami of the Empire State Building. And it was really hard to make. Yoda should thake you only about one hour or so. hey tom i bet you could youse our school cause i have a camera i have to just find it though because my school has just the right people. i know a kid named daniel cruis who is just like harvey. and i could be tom or dwight. 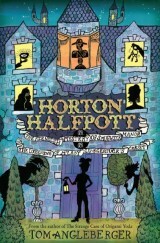 hey tom i need to know the EXACT date of the new books arival so i can get ready!!!! I don’t know the exact date yet either. I’ll post it when I know it! it could be as early as August! hey thats cool……………. Austin……..AUGUST its kind of simaler to your name thats cool i wish i could have a name similar to a month!!!!!!!!!!!!!!!!!!!! Hey Tom wanna know what’s funny….. My parents wanted to name me Aniken. Ps sorry if I misspelled it. No like Aniken from Star Wars! No like Anakin from Star Wars! I misspelled it earlier! They named my Austin because they thought people would call me Annie! Tom, I know this ay be like the millionth time someones told you this, but, you really should try and make a real movie. If it worked, i would probebly go to it mor thn once! That seriously would be a great moneymaker and it would get the book more publicity. I mean come on, I am dyng to see what dwight would look like in eral life. Plz take at least make a small video. I want a movie, too!!! But it’s out of my hands. All sorts of people would have to agree to it. Someday, I hope they do! hey tom good news i have decided how we can do this movie thing: i have a video camera so i could make it at my school it wont be exactly like the book because it will be like burglary or something but any way in the credits we will have your name as the creator. then ill go to walmart and get it on dvd or somethin the ill send it to u to post it on this web site does that sound good to u tom??? hey tom, wouldnt it be awesome if dwight’s yoda battled the kawahata yoda? I can make a deluxe Yoda! MY NAME IS NOT ALEX! this book is the best book ever! 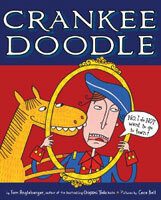 hey, Tom i finshed the book today. LOVED IT! I tried folding Yoda but i could not do it! got angry. looked at simple yoda. It did not look like yoda. (no afence)bye! Tom, I would like to tell you that they are all awesome folds. What is the release date for “Darth Paper Strikes Back”? after the sequel, you should make another!!! It could be called, return of the EMPAPER! how could you say that!! Get dis, my friend is wierd and he made an origami yoda and i made a darth paper and now we hate each other! Such a strong word hate is. when I brought my origami yoda to school I wrote about it its called the Amazing origami Yoda! hey guys go to you tube and type in lil boy has devil in him watch him appear out of nowhere it is HILLARIOUS. I made microscopic yodas I’ll send pics soon. No, I haven’t been able to get ANY this last year!! Boo! That’s ok, but if you get any, please let me know because I REALLY want to make an origami yoda with that kind of paper! soooo cute great job tom !! Where do you go to get the green and beige wrapping paper? You have to really search the stores for it at Christmas! thank you!also,you can tell the people that are having a hard time on how to make origami Yoda like the one on the cover,that the have a tutorial on how to make it!just go on YouTube and put:how to make origami Yoda like the one on the cover.Have a great Halloween! you know i think own desighn origami yodas have powers like a day before a field trip i brought my own desighn yoda two school and my friend sean asked a question about the field trip.he asked if the field trip would be good and i thought the field trip would stink but yoda said it would be great and he was right i couldent belive it!! can you guys?!? Hi Tom. This is Ethan. Once last year I showed everyone in my class how to make a yoda like this and a day after it was crazy!! There were pink yodas,TV yodas,fat yodas, skiny yodas, even FLYING yodas!!! I was sure everyone loved making these!!! Thank you!!! me and my friend made a huge paper airplane and put origami yoda in the top fold! canyou send me some directions for a easy darth paper. i have 20 of these!! is there going to be an emperor papertine? Tom i have the green and Brown paper but when i fold the 5 fold it makes the same color so i end up with a brown or green yoda not both can you tell me how to fold the one on the home page? Before you fold it, fold the bottom up a bit. This will make his robe brown and his head green. Wait i Re-Tried and i got it i see what you meen now! Hey, my 11th birthday is coming up… Can you send me a hard one, I just can’t master it and also, I can’t find origami paper :( please send it to me, and a paper or something that you can sign your name? If you can’t it’s ok. I made an origami Asoka. You rock,Tom! tom pleases please show us how to make origami yoda (exactly!) like the one on the cover! pppppllllleeeeeaaaaassssseeeee!!!!!!!!!!!!!!!!!!!!!!!!!!!!!!!!!!!!!!!!!!!!!!!!!!! 1 time i tried putting an origami obi wan in a paper airplane that had the same design as his jedi starfighter from episode ll. it was epic! im thinking about having both the jedi starfighter and a vulture droid flying at the same time! 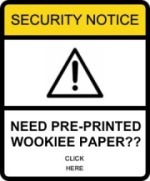 i need help on finding Dwights paper yoda . Tom Angleberger, you’re awesome! Cool idea!! Hey Tom! Is it ok if we have till the 30th to make Jodieo Rodeo? PLZ! I have been watching Starwars since I was like 5 I think! I’m an unofficial super folder. I made 5 fold origami Yoda into 11 fold (and rip) origami Yoda, now new and improved with feet ( and a big head). Try to make one Tom! Tom can you send me a dulux origami yoda? Figure it out I cannot. made a yoda today so awesome! I FINNALLY FIGURED IT OUT YES!!!! P.S. I figured out how to make an Origami Yoda harder to rip: glue all flappy parts down very good then let dry then Yoda’s Immortal!!! Awesome yoda! Really good!, already made one for school but it’s getting a little worn and torn, so I’m making this one! Wish me luck! Nope! I need his advice! 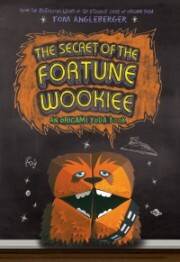 I’m reading the book the secret fortune wookie no one spoil it!!! I am sooo sad because I have made all the Yodas (including fish-goths and Kawahatis) and remember them all off by heart. now i can make kawahatis in about 10 minutes. I need something more complex. can anybody recommend something that’s actually difficult??? I’ve memorized how to make this yoda. 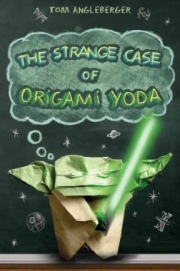 the strange case of origami yoda is sick and i love it but sadly i don’t have it yet. when i get it i will leave a message behind to the fans. 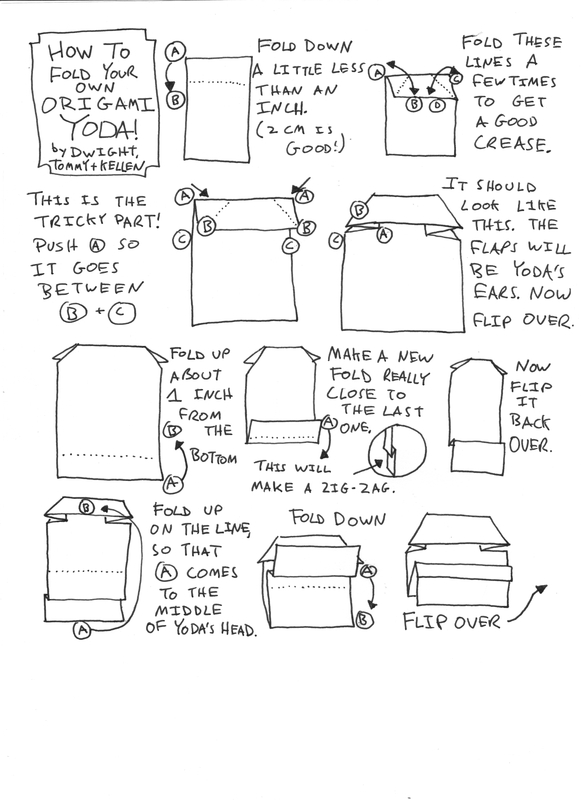 I plan on making origami yoda comics. Tom Tom Tom please please please make make make a a a movieeeeeeee! Those instructions were awesome! I folded a bunch of those! MAke sure you use him for good, not evil! 1.start with 1/4 of paper. 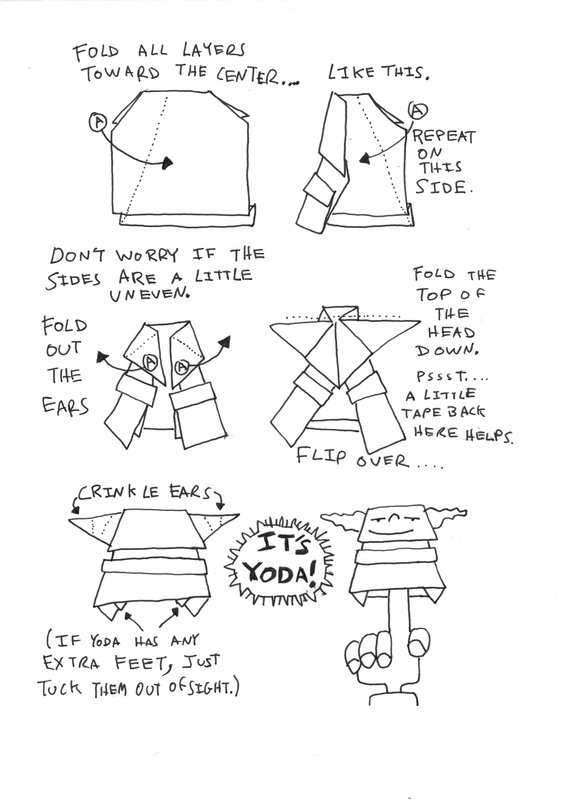 2.fold top a little more than half3.fld where u folded up to mke mouth then crinkle top for eyes4.fold entire head up then fold in body make sure yodas right is above his left5.on right side fold the thing down so u get that rectangle thing.You are done! Thanx for this yoda its cool. Darth Paper+Origami Yoda+Backup Yoda+Fortune Wookie+Han Foldo=TOTALLY STOOKY!!!!!!!!!!!!!! ditto, origamifanman. Harvey is PIKPOK PETE!!!!!!!! Origami yoda is TOTAL ROCKETS and STOOKY and JELL-O and PLASTIC DINOSAURS!!!!!!!!! Han Foldo and the Fortune Wookiee too. 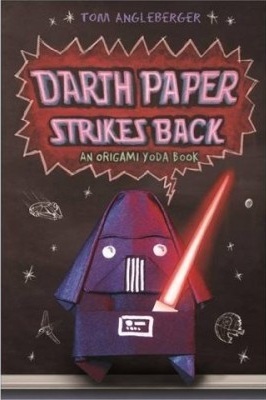 PLEASE MAKE MORE ORIGAMI YODA BOOKS AFTER ART2-D2!!!!!!!!!!!!!!!!!!!!!!!!!!!!!!!!!!!! Who will the next book be about? If its Luke i totally figured out how to fold gr8! Origami Yoda = TOTAL ROCKETS! I have most of the books and so far they are REALLY good. Origami has to be my favorite thing in the universe. 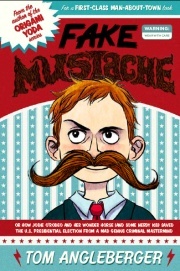 Tom, may I suggest for the fifth book (if there is going to be one) Dwight and Harvey work together to fix problems a bully is causing. Causing using a KIRIGAMI GENERAL GRIEVOUS! I can’t listen to your guy’s narnar. 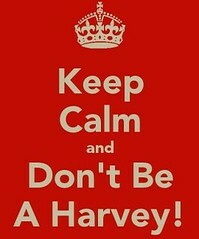 Harvey de boss!!! yoyo tom thanks for sighning my book it was awesome and i made a custom yoda! so did my freind :). stooky : you are saying some one is awesome tater tot and cheto hog ! Dude thx i never knew how to make him! I’ve already folded 5,21 cover Yodas. This Yoda always ends up really tall when I make it ( I probably used the wrong style of folding) but I love it. tom its kinda hard to read what kellen writes can you tell him to write a little neater in the next case file? This Jabba book looks CRAZY!!!!!!!!!!! tom, how do you post something ???? ?